Bob Bailey (born Robert Bainter Bailey, June 13, 1913, Toledo, Ohio – August 13, 1983 Lancaster, California) was an American actor who performed mostly on radio but also appeared in films. One of Bailey's earliest roles on radio was that of the title character in the comedy serial Mortimer Gooch (1936–37) on CBS. :366 In the early 1940s Bailey was regularly featured on network radio programs originating from Chicago. He played the boyfriend of the title character's sister in That Brewster Boy and the father of the title character in Meet Corliss Archer. He played Bob Jones in Kitty Keene, Inc.. He was signed in 1943 by 20th Century-Fox and appeared in seven feature films; the first two (in which he was most prominent) starred Laurel and Hardy. After the studio failed to renew Bailey's one-year contract, he returned to radio. Starting in 1946, Bailey starred as freelance detective George Valentine in the radio drama Let George Do It, but he is best remembered as the title character in the long-running radio series Yours Truly, Johnny Dollar. The program ran from 1949 to 1962 (it and Suspense were the last CBS radio drama series on the air until the CBS Radio Mystery Theater began in 1974) and featured the exploits of "America's fabulous freelance insurance investigator"; Bailey starred as Johnny from 1955 to 1960 and wrote the script for the December 22, 1957 episode "The Carmen Kringle Matter" using the pen name "Robert Bainter". With CBS devoting more money to television and wanting to reduce costs, Yours Truly, Johnny Dollar relocated to New York in 1960 and Bailey, unwilling to relocate, was dismissed. Having performed in almost 500 episodes, he had made the role his own. With the end of his involvement, the show wound down over the following two years (with two different actors) before being taken off the air in 1962, by which time Bailey had virtually given up acting. Near the end of the 1962 film Birdman of Alcatraz, he can be seen as one of the reporters gathered around Burt Lancaster and Edmond O'Brien. 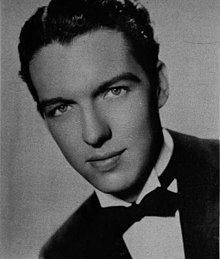 (O'Brien had portrayed Johnny Dollar on the radio from 1950 to 1952.) Bailey's role was only a bit, and most of his dialogue was dubbed by another actor. Bailey struggled with alcoholism as his health declined, but did recover toward the end of his life. He died in Lancaster, California, aged 70, on August 13, 1983. ^ a b Terrace, Vincent (1999). Radio Programs, 1924-1984: A Catalog of More Than 1800 Shows. McFarland & Company, Inc. p. 190. ISBN 978-0-7864-4513-4. ^ "She's In Again". The Mason City Globe-Gazette. January 28, 1943. p. 2. Retrieved March 28, 2015 – via Newspapers.com. ^ MacGillivray, Scott, Laurel & Hardy from the Forties Forward (Second Edition), iUniverse, 2009. ^ Dunning, J.: "On the Air", Oxford University Press, 1998. ^ "He wrote some episodes of Fury, which starred Peter Graves and Johnny Diamond, along with a black horse, under his alternate pen-name of Robert B. Bailey". Retrieved January 24, 2018. Bob Bailey profile, MWOTRC.com; accessed January 24, 2018. This page was last edited on 24 August 2018, at 13:38 (UTC).